Of all the arts of China calligraphy is the most esteemed. It embodies the highest visual, philosophic and aesthetic ideals of the scholar for whom proficiency in the Four Accomplishments - painting, calligraphy, poetry and chess - was a fundamental objective, indeed a necessity. Of equal significance are the Three Perfections: painting, poetry and calligraphy, with calligraphy again deemed to be the highest achievement because it combined the beauty and morality of ideas and poetry with the visual eloquence of writing. In consequence, as much emphasis was placed on the expressiveness and aesthetic fluency of calligraphy as on its meaning. Of the many groups and styles of calligraphy, the cursive or 'caoshu' - literally 'grass script' - style is among the most expressive. It is distinguished by its spontaneity, speed and dynamic energy, but always without compromising the legibility of the characters.The scroll comprises three poems composed by the artist, under the overall title 'Constantly changing clouds', which is written in four large characters at the beginning. 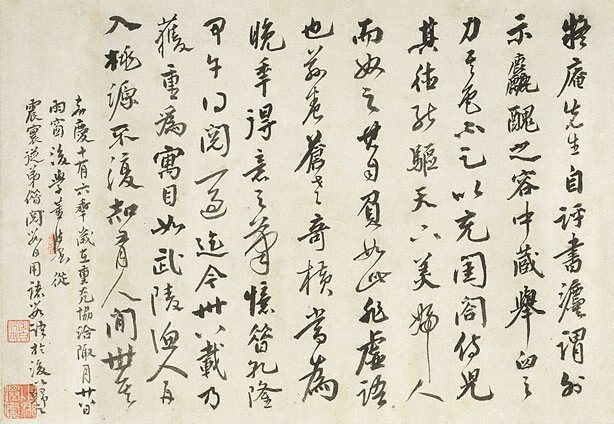 While little is known of Yu Shaozhi, except that he came from Wuyuan in Anhui province, the status of this work is confirmed in a poetic inscription dated 1916 by the great late Qing dynasty master Wu Changshuo (1844-1927) which praises the quality of this calligraphy. Art Gallery Handbook, 1999. pg. 255. Signed.,c.l., in Chinese, inscribed in black ink "Yu Shaozi". Signed.,c.l., in Chinese, stamped in red ink, "Zi Shou [artist's seal]".